Documentary filmmaker and writer Bill Bidiaque, debuts his Christian fiction/Christian thriller novel, Jesus in Jeans, based on the life of Jesus, cast in the 21st Century. 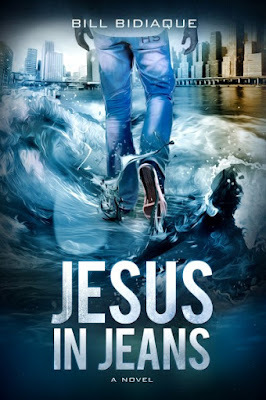 Jesus in Jeans is published as a WestBow Press title; WestBow Press is a division of Thomas Nelson Publishing and Zondervan. Set in a fictional nation called Y’Isra – based on the Israel of old – the novel narrates the days of Jesus on earth in a contemporary context. We meet Jesus as Jay Elion. Our first encounter with him is at the sanctum, wreaking havoc on bureaux de change and electronic dealerships. Jay Elion claims he’s been sent to save Earth from damnation, his mission beginning in Y’Isra. This pits him against the Syndicate of Religious Lawyers, the Moranê Empire, and the Y’Isran patriarchy – who all have their own interests to guard. To fulfil his mission, Jay organizes campaigns across Y’Isra with his twelve-man crew and his growing popularity threatens the fabric of power that the three antagonists have woven. His exploits attract several assassination attempts but Jay scales through them in stride. We journey with Jay, getting a modern perspective of the life Jesus lived; like 2,000 years ago, Jay speaks to the elements and they obey, whether he’s on a Boeing 787 Dreamliner or a sport fisher yacht. The book is available on Amazon, Konga and Westbow, in Hardcover, Paperback, and e-copies. Bill Bidiaque believes that the media is an effective tool for mind-change and is poised to exploit the vast opportunities for this purpose. He’s a screen writer and a documentary filmmaker, and lives in Lagos, Nigeria with his wife. Bill is available for interviews. To book interviews, appearances and/or book-signings, please contact holla@billbidiaque.com.